Please be advised, a containment breach has been detected at the Union Aerospace Corporation Martian Facility A113. Recommend all staff evacuate at the earliest convenience. This is a Priority 6 alert. Any personnel remaining on the premises will void their UAC term-life insurance policy. Emergency containment teams are inbound to secure the facility and ensure compliance. 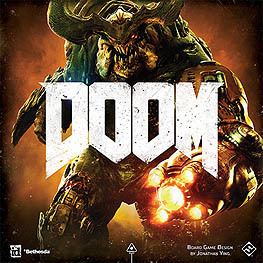 DOOM: The Board Game thrusts up to four heavily armed marines into the fight to protect humanity against the darkest evils of Hell. The UAC Marines will load up their arsenal as they charge through treacherous missions, struggling fiercely to overtake the invader's horde of ravenous demons and accomplish near-impossible feats. Each Glory Kill will bring the marines closer to victory, but not without leaving a trail of slaughtered monsters in their wake... and taking a few fatal blows themselves.